When I was talking about Uranus moving into Taurus the other day with my brother, he commented wryly that it seemed like there was always some “big transit” or “major cosmic shift” occurring. I cringed a bit, because I recognize that from an outsider perspective astro weather updates can appear rather sensationalist and over-the-top in a repetitive way. Like omg eclipse season, omg mercury retrograde, omg this scorpio full moon, omg uranus into taurus. Epic transformation. Always, and forever, every week. Of course there are ALWAYS cosmic shifts happening. The astro theatre stage of life involves circular orbits and repeated intersections from many different angles formed by planetary bodies moving at various speeds. Many of the the smaller cosmic stories play into other larger, ongoing, overarching stories though, so it’s not like each transit represents an entirely new thing blasting into your life. There can be “activations” of a larger narrative, via a faster moving transit. I find it really challenging, when writing about astro weather, to convey the appropriate magnitude of the scale of a transit, through words. I’m zooming in and out, from micro astro to the macro, all the time, but it isn’t always easy to put everything in context for others. When talking about astro weather with family, or those with less astro literacy, I’ve decided to use a 1-10 scale as a quick reference. Super simple and reductionist, but it is an easy way to describe the relative importance of current transits. Then of course, there’s the fact that there are both global transits taking place at the present moment, affecting all of us, as well as personal transits, affecting us individually because of the way they are interacting with our birth charts. Some major global transits will be more consequential to certain people because of their birth chart configurations. I can’t fully take into account personal transits when writing public forecasts, so on this platform, I’m primarily working on conveying with greater clarity, the scale and relationships between different cosmic events and cycles. …which brings us to this present moment… Actually it brings us to March 16th, when I had hoped to post this. 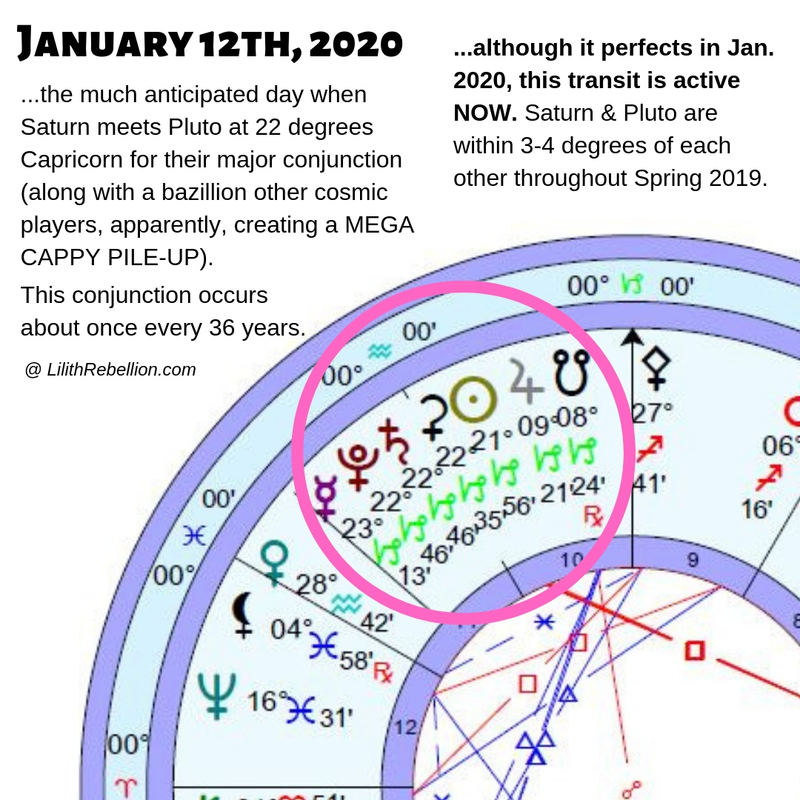 On March 16th, for the first time since entering Capricorn, Pluto hit the exact degree and arc-minute where the big Saturn-Pluto conjunction will occur on January 12th, 2020 at 22 degrees, 46 arc-minutes of Capricorn. My use of the adjective “big” here, in reference to the conjunction itself, is assigned my rating of 10/10. Pluto touching down on the zodiacal degree where the conjunction will eventually take place, is preparing the ground for what is coming. Pluto will transit this exact point again on June 4th, 2019 before it completes its union with Saturn there in early 2020. But honestly, since we are working with slow, outer-planet heavyweights here, the implications of this conjunction are active RIGHT NOW, with Saturn and Pluto (and the South Node) only a few degrees apart throughout the Spring of 2019. As you probably know, Uranus entered Taurus a few weeks ago, in early March. I would consider that to be another really major transit since Uranus is an outer planet and it will be in Taurus for 7 years, signifying an important global theme or chapter encompassed by that time period. It will take 84+ years for Uranus to make it back to Taurus after it exits the sign in 2026, so it’s a once in a lifetime occurrence for many of us. In contrast to the rating of 10/10 that I gave the Saturn-Pluto conjunction in Capricorn, I’ll give Uranus’ ingress into Taurus like… an 8/10 rating… in terms of its magnitude and importance for the world 🙂 Too low? Maybe 9/10. I’ll have to think more about this global astro ranking scale! I think two outer planets coming together in a conjunction is as potent as it gets, but an outer planet changing signs still delineates an important new chapter in the world’s history. Uranus’ entrance into Taurus speaks with speed. It’s unpredictable, unconventional, rebellious and fast-moving energy showing up in our lives with rapid, sudden changes, continued uncertainty and risk-taking leaps. The Saturn-Pluto dynamic in Capricorn is quite different. It is slower, grittier, deeper. There’s sure to be both external and internal dimensions and manifestations, but this is likely a more gradual process that asks for a thorough and careful, strategic restructuring of our lives, our work in the world, and the way that we express and manage our power. It necessitates a dive into our inner caverns and a courageous confrontation with all that we hide. Endurance, resilience, perseverance, authenticity, honesty, integrity, responsibility and accountability are big themes in this Capricorn area of your chart – at all times, but especially during this 3ish+ year window 2018~2020. The Capricorn action happening over the next couple years, is really quite remarkable. Jupiter joins the Cappy party on December 2nd, 2019 for its 1-year commute through the sign, amping up the whole process with its powers of expansion. 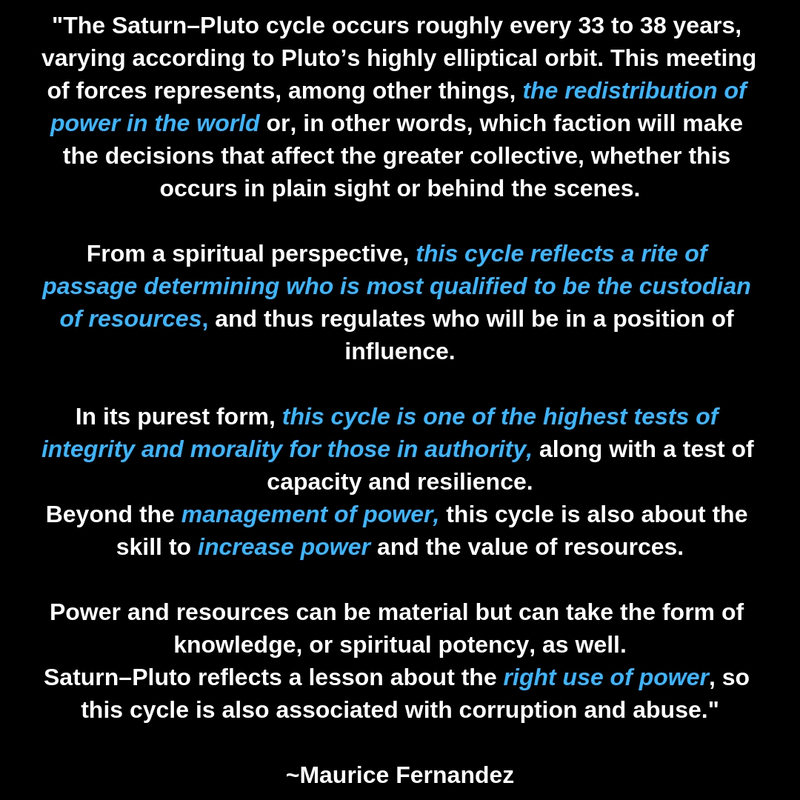 I highly recommend Maurice Fernandez’s exploration of the Saturn-Pluto conjunction in this article. By identifying where Uranus is transiting in your chart, and where 22 degrees of Capricorn lands (according to the house and any personal planets/points impacted), can you recognize the two different qualities of movement and change occurring in different areas of your life? Of course, an individual’s life is rarely compartmentalized into nice and tidy sections. If one area of life is experiencing major change, this will ripple out to affect everything else. And yet, you may still be able to pinpoint these two unique energies at play. The last Saturn-Pluto conjunction we experienced happened on November 7th, 1982 at 27° Libra, and the Saturn-Pluto conjunction prior to that, occurred on August 11, 1947 at 13° Leo. If you were born within a year or so of these dates, it’s possible your natal chart itself, holds the energy of this dynamic. For example, for the last few months I’ve been studying the life of Marina Abramovic in great detail, through an astro lens. She was born November 30th, 1946, with Saturn and Pluto within 5 degrees of each other in Leo, trining her Sun fairly tightly. There’s lots of other variables going on in her chart of course, but the influence of the Saturn-Pluto conjunction appears to me, quite vivid in her life’s journey. Side-note, but I think it is important to remember as we approach a major conjunction or cosmic shift, that many of us have already lived through and experienced many significant cosmic events – and presumably we survived! (e.g. Pluto entering Capricorn, Neptune entering Pisces, the Saturn-Uranus-Neptune triple conjunction). And, for as long as the Earth orbits in this solar system, there will be many more “major transformative 10/10 cosmic events” to follow in the future… including the Jupiter-Pluto conjunction in April/June 2020, and the potent Saturn-Jupiter conjunction on December 21st, 2020… Such is the nature of this cyclical system of life. One of the noteworthy public events that occurred around the time of the last Saturn-Pluto conjunction in November 1982, was the release of Michael Jackson’s Thriller album. The following year, on December 2nd, 1983, Jackson’s wildly popular 14-minute Thriller music video was released (here’s a Vanity Fair article about the behind the scenes production process). And then of course, Thriller went on to become one of the all time top world-wide best-selling albums. More importantly though, it was ground-breaking and transformative in that it broke through longstanding racial barriers in the music industry (creating a Libran bridge in the arts scene), skyrocketing Jackson into the limelight. The Thriller album was actually released on November 30th, 1982 (several weeks after the Saturn-Pluto conjunction), on the day that Saturn left Libra and entered Scorpio, but at this point Saturn and Pluto were still in a tight conjunction with each other with only a 2 degree orb. 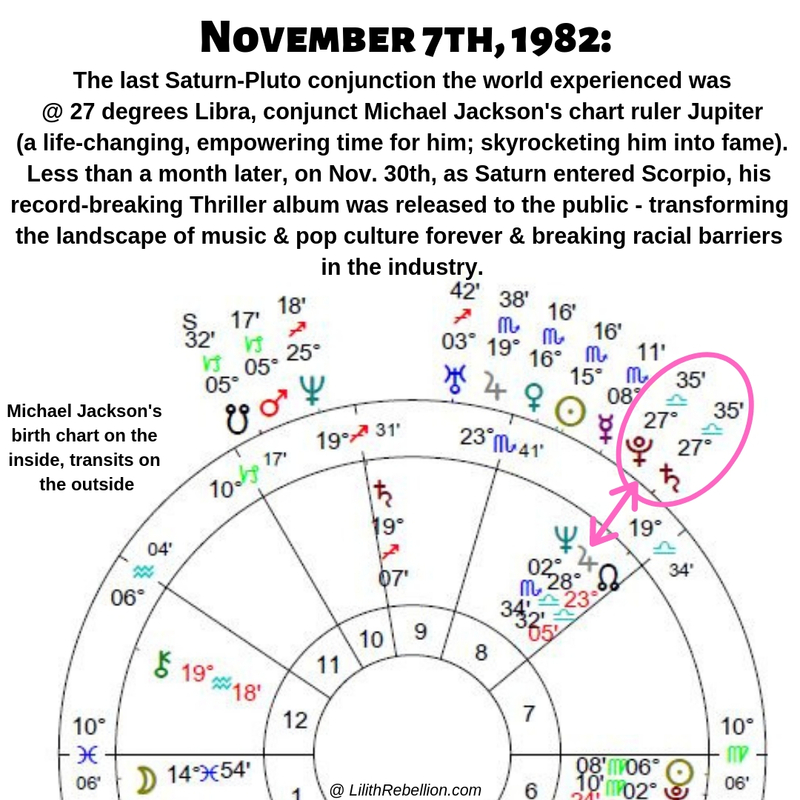 Obviously Saturn in Scorpio makes perfect sense as well, but I really see Thriller as a Saturn-Pluto story since the conjunction was occurring conjunct Jackson’s Jupiter, his chart ruler, as he was preparing to send the album out into the world. The November 1982 Saturn-Pluto conjunction speaks to the origin moment, the catalyst, foretelling the themes of the next ~36 year Saturn-Pluto cycle that was just beginning. The 14-minute Thriller music video is a horror spoof featuring Michael Jackson who transforms into a werewolf (and later a zombie) while on a date. The video and lyrics are extremely resonant with the symbolism of a Pluto-Saturn conjunction (conjoining in charming, relational, artistic Libra in 1982, and now in earthy Capricorn). The Library of Congress described it as “the most famous music video of all time“. In 2009, it became the first music video inducted into the National Film Registry as “culturally, historically or aesthetically” significant… Michael Jackson’s Thriller video sealed MTV’s position as a major cultural force, helped dissemble racial barriers for black artists, revolutionised music video production, popularised the making-of documentaries, and drove rentals and sales of VHS tapes. Music video director Brian Grant credited “Thriller” as the turning point when music videos became a “proper industry“. Gil Kaufman of MTV described the video as “iconic” and felt that it was one of Jackson’s “most enduring legacies”. The lyrics and the video have an ominous prophetic quality to them, masked beneath a pop culture Libran mask – especially when we consider that they were brought forth at the beginning of the Saturn-Pluto cycle that we are currently completing. Thriller also heralded the Pluto in Scorpio era, which we were embarking on as the music video was released. I see the rippling echoes of these lyrics – both in terms of Michael Jackson’s life and legacy, and also in current world events in general. 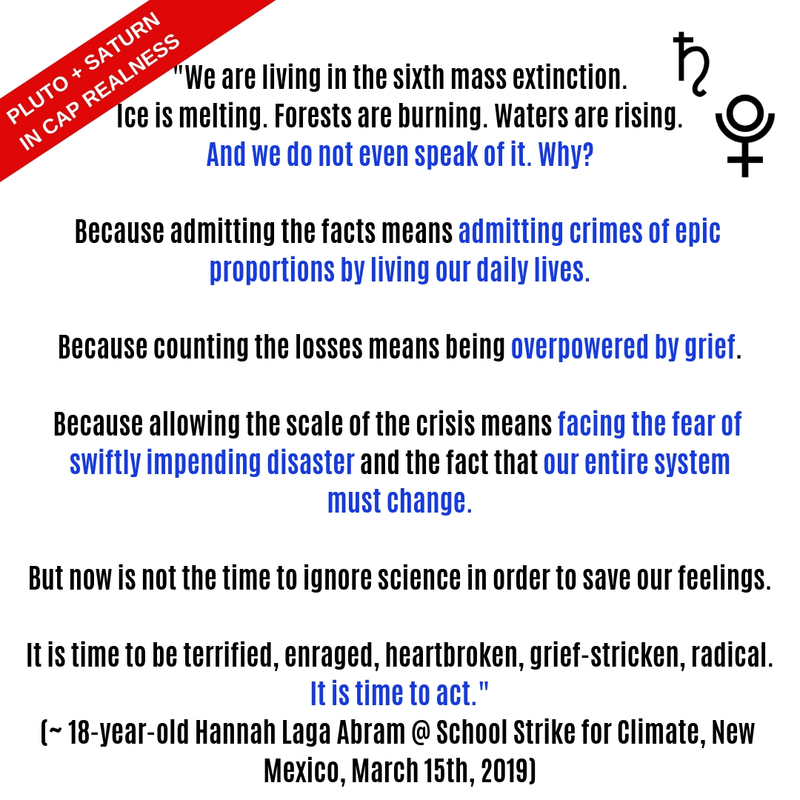 I wrote my last post on Mercury cycles before the attack began. I believe Mercury was within an hour of finishing its last synodic cycle, beginning to center itself in front of the Sun when the attack occurred. It was a little unnerving to reread my last post in retrospect. Studying or writing about the astrology of tragedies and crimes is always a tricky thing. It can be insensitive, distracting from what is being asked of us in the present moment, and it can create an escape hatch to the left-brain’s preferred method of distancing itself through intellectualizing, analyzing, containing, labelling, packaging. I think that, when astrology is used appropriately in these situations, it can reflect back to us, important warnings, reminders, lessons, and guidance. On March 15th, with Mercury (thoughts, perception, words, language) illuminated by the Sun (purpose) and in the control seat… as Mercury sextiled Pluto at the future Saturn-Pluto conjunction degree… the configurations in the cosmos spoke to the importance of paying attention to our language and our thoughts, and addressing the racism, the islamophobia (no matter how subtle, subconscious and hidden) that may surface in our casual conversations, our internal dialogues and perceptive filters. The Sun’s purification process during the Mercury cazimi, demands that nothing be shoved under the rug. Words matter. Both toxic political rhetoric on the world stage, and office chitchat behind closed doors, shape our realities, our worldviews, and ultimately our actions. Honestly facing our shadows is acutely uncomfortable, but so necessary for the possibility of future peace built on strong and stable foundations. 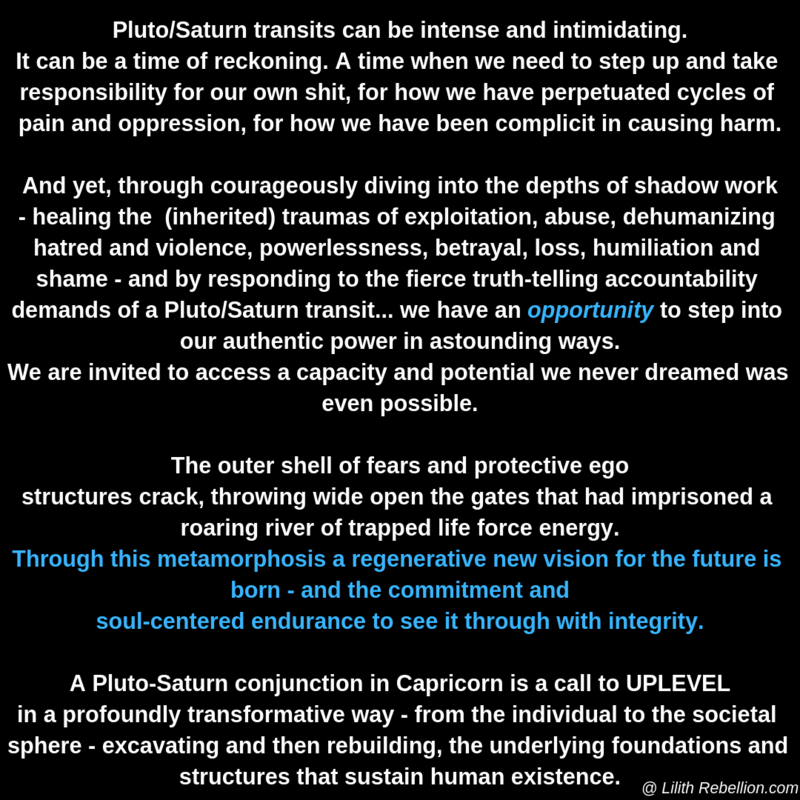 The ongoing Saturn/Pluto-themed “falling from pedestals” that many celebrities and esteemed public leaders are experiencing as their crimes come to light and their Capricornian reputations and status take a mighty hit (e.g. last week’s exposure of the college admissions bribery scandal), should not distract us from our own inner shadow work. It is convenient for the ego to have public scapegoats to project on to, while seeking exemption and attempting to reify “the good people vs the bad people” binary (e.g. the #notall… hashtag), but we are all complicit in cycles of pain and oppression in some way or another – and for averting our eyes from difficult truths. We can hold each other directly accountable for the specific pain and harm we have caused, while simultaneously acknowledging (and addressing) the ways in which intergenerational trauma, childhood trauma, far-reaching histories of violence, and systems of oppression… have contributed to creating who we are today and the conditioned patterns that are playing out in our lives. It is really challenging work to navigate these complexities when our (social) survival instincts propel us to direct blame as quickly as possible in ways that distance the public wrongdoer as far away from us as possible, organizing ourselves into cleancut victim-perpetrator, innocent-guilty binary roles and identities. Pain begets pain, and the larger oppressive systems that we are largely dependent on, feed and maintain these ongoing intergenerational and hierarchical cycles of exploitation and destruction in a myriad of ways. This powerful conjunction in Capricorn demands that we dismantle these systems and break their hegemonic spell. It’s a high stakes red pill vs blue pill moment in history. I brainstormed this post months ago, before the ‘Leaving Neverland’ documentary was released early March. Afterwards, I considered not mentioning Jackson’s chart and the 1982 release of Thriller, but in many ways, the timing itself is significant as we return to the conjunction that aligned with the launch of his pivotal break-through success, 36 years ago… now at a time when the horrifying, abusive, and deeply wounded part of Michael Jackson’s life is publicly exposed. A full circle moment reflected in a cosmic cycle. This powerful Saturn-Pluto conjunction calls us to face our worst fears and shadow material, individually and collectively – exposing what’s stagnant and rotting so that we can enact justice, heal, transform, and rebuild with integrity. We all have blood and dirt on our hands. Along with Saturn and Pluto in Capricorn, we also have the Moon’s south node closely intersecting with these two, all throughout 2019 into mid-2020 (wildly, also intersecting with the south nodes of both Saturn and Pluto transiting Cap at the same time). The South Node empties us out, it cleanses, purifies, and exposes where we have become too comfortable and complacent. As it comes in contact with Pluto and Saturn, we’ll be seeing the shadow sides of these two planetary archetypes surface, in order to be addressed. 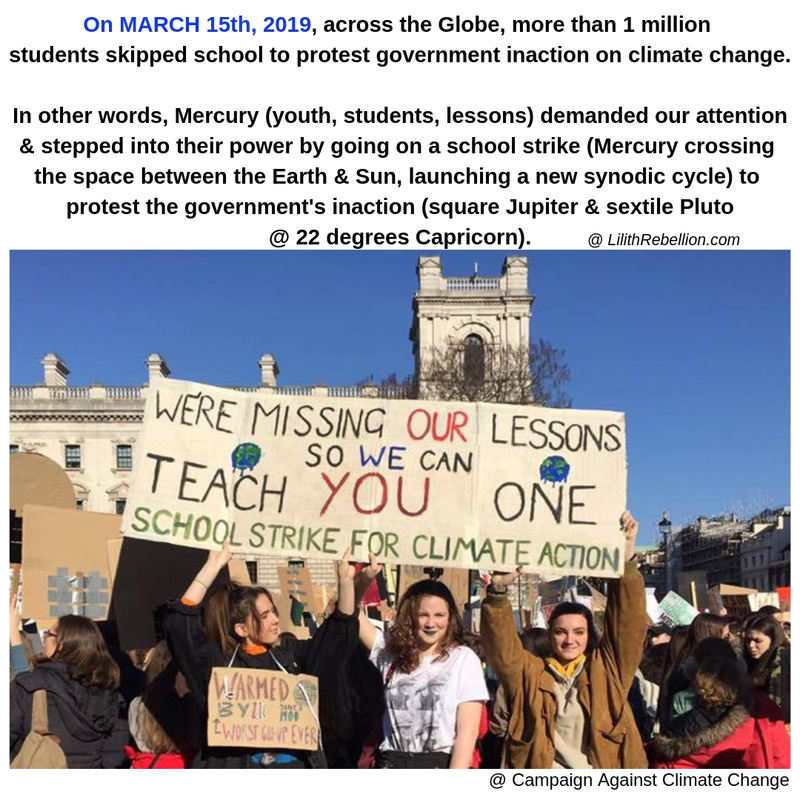 On March 15th, 2019 (Friday) there was the School Strike for Climate Change, where more than 1 million students around the world skipped school to protest government inaction on climate change. I see resonance between this collective movement and global event, and the Sun-Mercury cazimi (square Jupiter) that I discussed in my previous post. 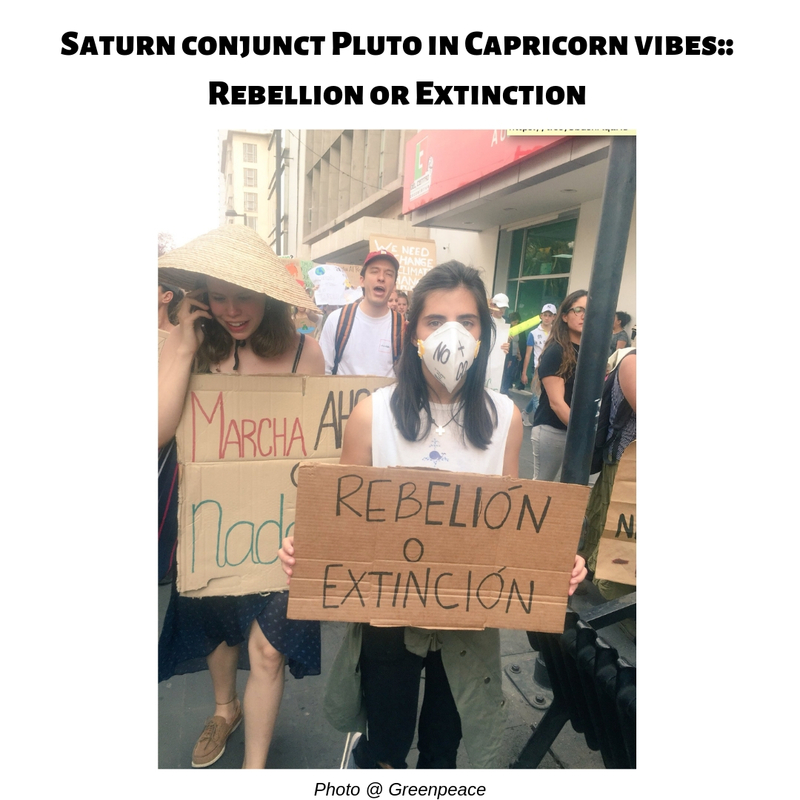 There is also resonance between this youthful protest against the powers that be, with Pluto hitting the future Saturn-Pluto conjunction degree point in earthy Cap, while receiving an activating sextile from Mercury rx in Pisces. 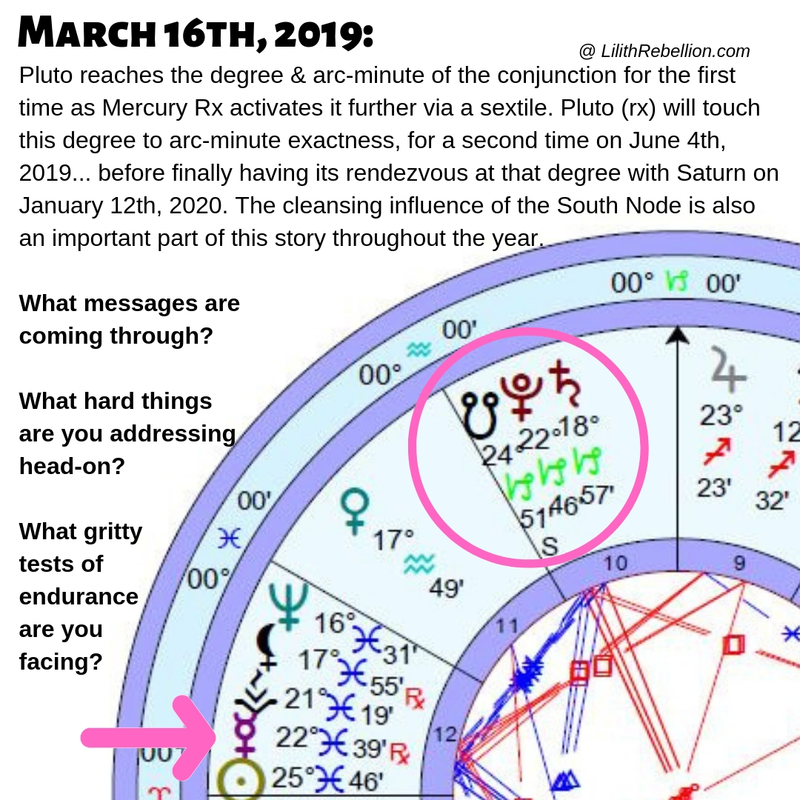 Furthermore, the actual Saturn-Pluto conjunction on January 12th, 2020 will occur right on top of Ceres – the asteroid embodiment of a vengeful mother earth, angry and grieving for how she has been betrayed and exploited. “Once we start to act, hope is everywhere. So instead of looking for hope, look for action. Then, and only then, hope will come. Today we use 100 million barrels of oil every single day. There are no politics to change that. There are no rules to keep that oil in the ground. So we can’t save the world by playing by the rules, because the rules have to be changed. Thank you for this well thought out post! A major reason I was drawn to this post, other than enjoying your writing, is that my Cancer Ascendant is at 22º26’. It was validating to read the intensity of these transits cause I’ve been feeling Pluto on me for awhile and I’ve been experiencing deep, ongoing transformations. Pluto had been square my Aries Midheaven then trine my Virgo Mars. Now it’s opposite my ascendant and square my Libra Venus too. My North Node is in Aquarius trine my Libra Venus as well so I wonder if that’s being affected at all. Uranus is trine my Uranus now too, lol. My life is actually calm but I’ve been feeling internal instability, or rather a break down of old behaviors and beliefs. I’ve also been waking up to a personal sense of power I haven’t had before, so I know the next few years in general are likely life changing for me, but I’m really curious what’ll happen around January 12, 2020 when everything clusters together. 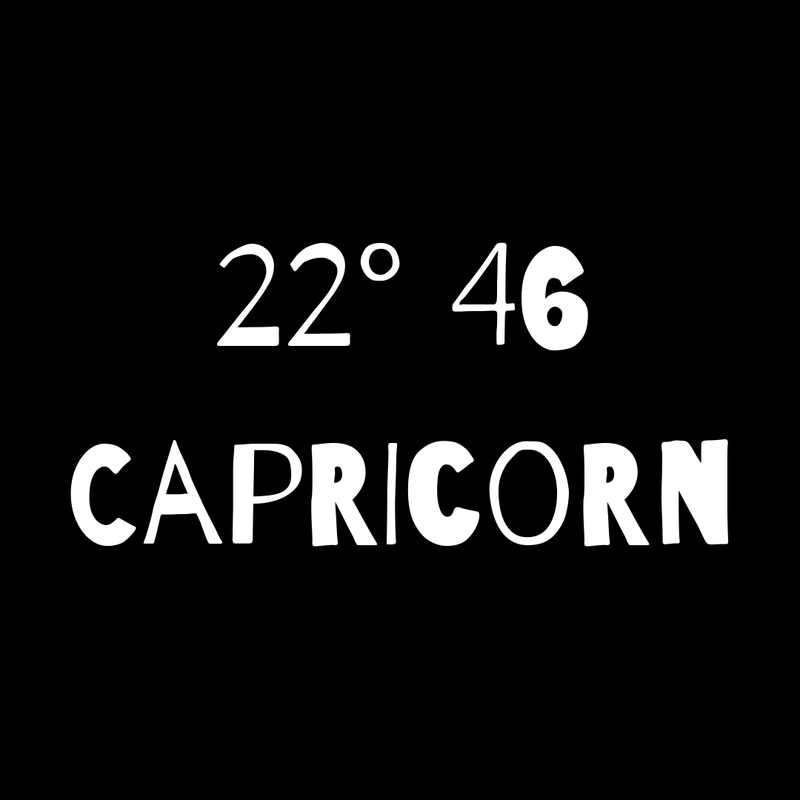 Interestingly to me, my sibling’s Capricorn Ascendant is at 24º so I wonder about that too and what’ll happen in their life. I’m also pretty excited to see what will come of the Jupiter-Saturn conjunction in Aquarius on December 21, 2020 on the solstice and what changes and advancements will be made. I’m sure it’ll be bumpy but all for the best in the end. Astrology is one of the reasons I’ve learned to be more patient, that’s for sure, waiting for these long transits to come around and finish. It’s really interesting to observe and experience. Hi! Thank you for your comment 🙂 I hadn’t signed into my website editor for a few days, so my apologies for the delay! I’m glad it was validating. With the conjunction occurring on your descendant, I imagine it would be pretty significant for you. The conjunction is very activated throughout all of April and into May (due to Pluto and Saturn being so close, while conjunct the South Node), and then by the time we reach the end of the year (~December 2019) the conjunction will be in full force again (e.g. the Capricorn solar eclipse on Christmas day certainly is quite something). For further insight, you could take note of your natal Saturn placement and how this conjunction on your descendant might be rippling out in that direction.